Now this is excellent. I get a lot of crap for saying some posters look good, when they're really just typical, Hollywood-style posters. Well, here is something that should prove I can love something that is unlike anything else, a great poster for a film that some of you may not even like. SlashFilm has debuted the new Mondo poster, made by Iron Jaiden, for Ben Wheatley's cult indie horror hit Kill List, which is currently playing on VOD/iTunes if you haven't seen it yet. The the concept behind it, the symbolism, the way it ties in with the weirdness of the film, it's a stunning poster and I'm happy to mix up the Hollywood norm with this. 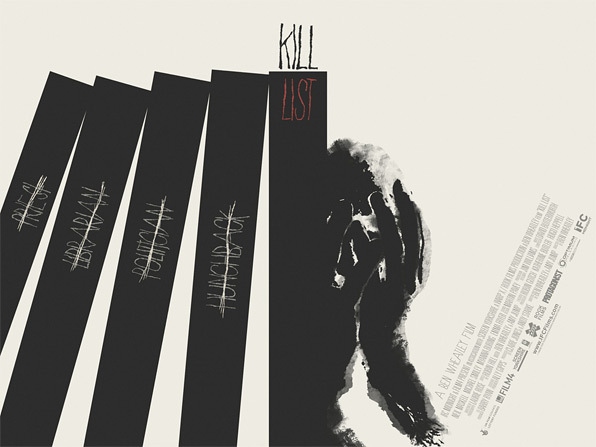 Kill List is directed by Ben Wheatley, written by Wheatley & Amy Jump. These posters, by Iron Jaiden, will be printed 18" x 24" in a small edition of 100, starting on February 23rd for $30. As always, if you're interested in getting any, follow @MondoNews for updates and availability. Kill List is an eccentric horror-thriller from British filmmaker Ben Wheatley that has gained cult status not only because it's about a cult, but because many horror fans love this film. Our own Golden Briefcase deconstructed the film in their first TGB Breakdown episode. This is a impressively unique piece of art, I only wish it was an official poster, too. Been looking forward to this one since last year.